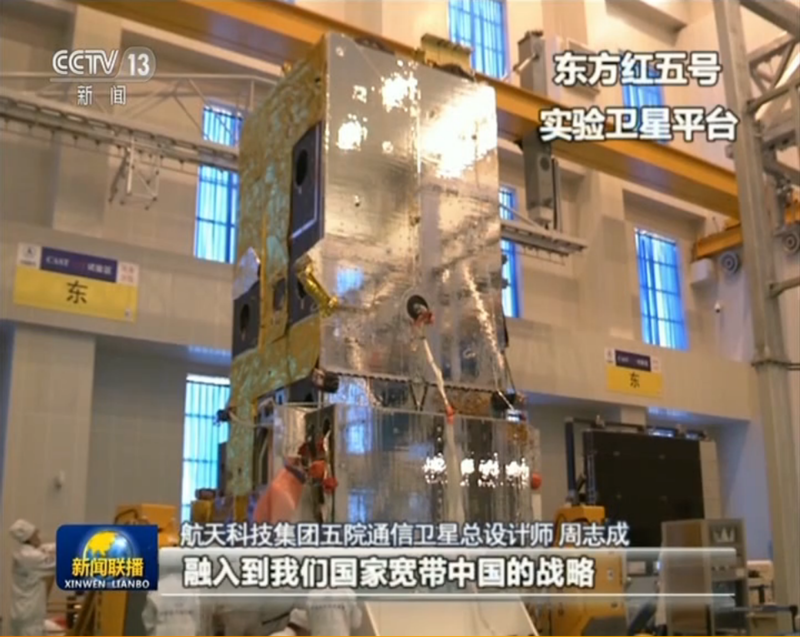 Shijian-18 is a Chinese experimental Geostationary Communications Satellite debuting the new, state-of-the-art DFH-5 satellite platform that will enable future high- and ultra-high-performance communications satellites. Weighing in at over seven metric tons, Shijian-18 will be the heaviest Geostationary Satellite as of its June 2017 launch, surpassing the previous record holder TerreStar-1 (6,902kg). 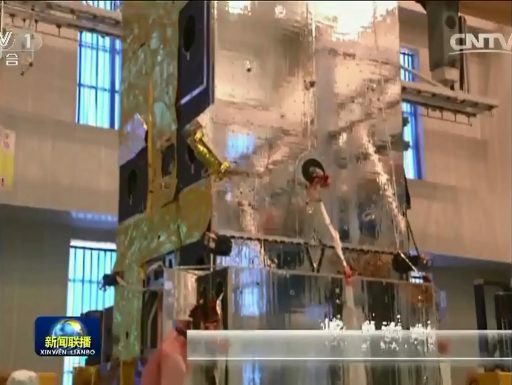 The Dongfanghong-5 (DFH-5, ‘The East is Red’) satellite platform is China’s latest generation of Geostationary Satellite for high-power applications. Developed by the China Academy of Space Technology (CAST), the DFH-5 platform incorporates a number of new technologies like high-thrust ion propulsion, a large trussed structure and a much increased payload capacity. According to CAST, DFH-5 has been baselined for a launch mass of 6,000 to 9,000 Kilograms, eclipsing any other GEO Satellite before it. 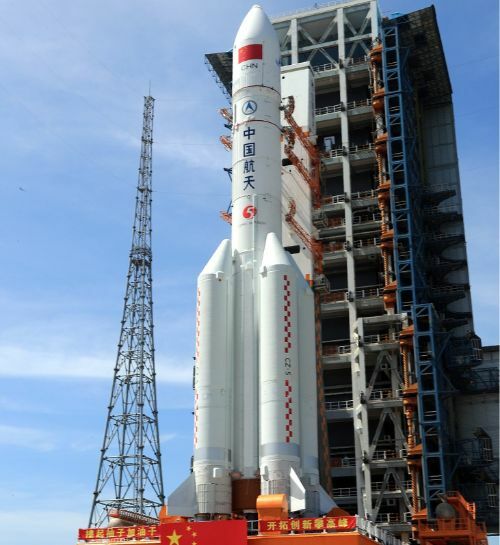 The platform has a dry mass of 1,800 to 2,750 Kilograms and can carry payloads of 1,200 to 2,200 Kilograms, tripling the payload capacity of the DFH-4 predecessor. DFH-5 can support a payload power up to a whopping 28 Kilowatts and is designed for a typical in-orbit life time of 16 years. The original DFH program, back then known as Project 651, was initiated in 1965 as China’s first satellite program culminating in 1970 with the launch of the 173-Kilogram DFH-1 satellite on a Long March 1 rocket. The DFH designation was transferred to China’s Geostationary Satellite Program and the DFH-2 bus premiered in 1984 with spin-stabilized communications satellites operated by the Chinese military. The DFH-3 satellite platform is a three-axis stabilized satellite bus for applications beyond communications. 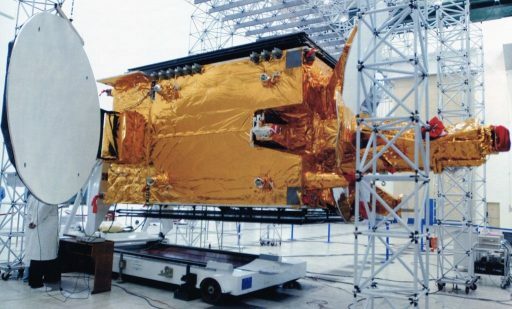 It debuted in 1994 but failed to reach its intended orbit due to a problem with its apogee motor; the first DFH-3 satellite to successfully reach orbit launched in 1997 and the platform was used for civilian and military communications, China’s Beidou navigation satellite system in Geostationary and Medium Earth Orbit, the Tianlian Data Relay Satellites, and the Chang’e 1 and 2 exploration missions to Lunar Orbit. DFH-4 is a large, current generation telecommunications satellite platform with a launch mass of 5.2 metric tons and a payload capacity of 588 Kilograms, catered to meet demands for medium to high-power communications satellites. The first two DFH-4 satellites, launched in 2006 and 07, suffered solar array failures and the first successful launch came in 2008 with VENESAT 1. By 2014, over 50 DFH series (DFH-2 upwards) were launched into orbit including commercial communications satellites for operators outside China. 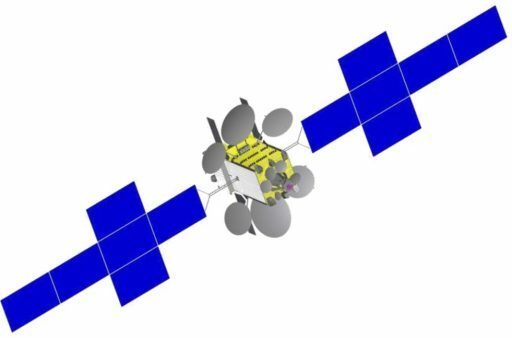 With growing demand for the satellite platform, CAST branched out DFH-4 into three different versions. The baseline DFH-4 stands 3.7 meters tall, has a launch mass of 5,200kg and hosts a payload of up to 588kg / 8kW. A small version in the four-metric-ton class, DFH-4S, stands 3.2 meters tall and can hosts payloads up to 450kg / 4kW and DFH-4E, an extended version, is in the 5.5-metric ton class, carrying payloads up to 1,000 Kilograms with a nominal payload power of 11kW. Additionally, a DFH-4SP version with all electric propulsion and dual launch capability is also under development. Standard features of the DFH-4 series are high-precision attitude control, new generation avionics, Li-Ion batteries, Electric propulsion and improved thermal coupling. A new development for DFH-4S is Overlap-Deployable Antenna technology to allow two antennas to be stowed against the same satellite panel before deploying in flight. This feature is also available for DFH-4E plus new deployable thermal radiators and a multi-floor core module structure to hold the satellite components. DFH-5 makes use of standard DFH-4 systems and new additions of the DFH-S/E modifications plus advanced systems specifically developed for the new-generation satellite bus such as a Truss Structure Configuration, a 2D Twice Deploying Semi-Rigid Solar Array, and an advanced type of self-controlled propellant tank. The DFH-5 satellite platform features a truss structure to carry all dynamic loads and a modular solar array design, baselined for a pair of six-panel solar arrays with power generation available from 10 to 30 Kilowatts. Thermal control makes use of new heat pipe network designs and propulsion is provided by a combination of chemical thrusters and ion engines. Ion engines employ a heavy atomic species, typically Xenon, that is ionized, accelerated in an electric field and expelled at extremely high velocity – allowing the system to operate extremely efficiently in terms of the impulse achieved. Compared to conventional chemical rocket engines, ion engine systems offer a tenfold increase in specific impulse, but only reach a fraction of the thrust – making them suitable for in-orbit maneuvers over an extended time period whereas chemical propulsion is used for large changes in velocity in a short time span. Electric propulsion systems have the major benefit of increasing the payload mass a satellite is carrying or decreasing launch costs through reduction of spacecraft mass. DFH-5 has been baselined for the LIPS-300 propulsion system developed by the Lanzhou Institute of Physics and features higher performance characteristics than the LIPS-200 system flown on previous Chinese satellites. 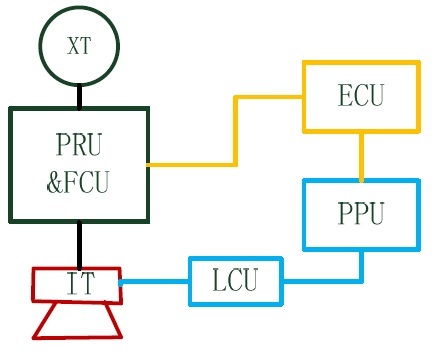 The LIPS-300 propulsion system comprises the ion thruster itself, a power processing unit, electric-propulsion control unit, Xenon tank, pressure regulation & flow control unit and a line connection unit. 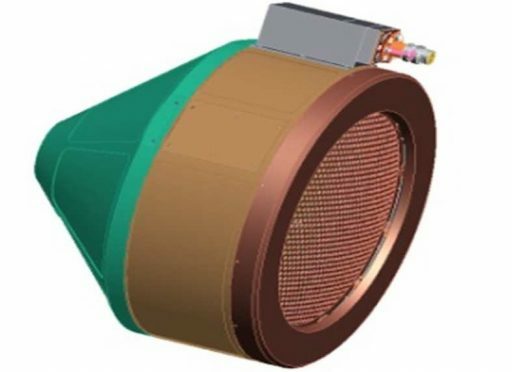 The LIPS-300 ion thruster has been developed for dual-mode operation with a baselined thrust of 210 millinewtons if being used for orbit-raising during the transition into Geostationary Orbit and 80 millinewtons for Stationkeeping. For operation at the lower-threshold, the thruster requires 2,200 Watts of power and delivers a specific impulse of 3,200 seconds. The high-performance 210mN setting requires 5,000 Watts of power and achieves a specific impulse in excess of 3,500 seconds. On the Shijian-18 mission, LIPS-300 will be primarily used for stationkeeping in Geostationary Orbit. Stationkeeping is necessary due to perturbations in the satellite’s orbit caused by gravitational influences from Earth as well as solar pressure which, in combination, cause a GEO satellite to drift in the East-West direction and induce a North-South motion that would eventually place the satellite into an inclined orbit. East-West stationkeeping only requires 1.3m/s of delta-v per year and is almost negligible in propellant consumption when using conventional thrusters, however, North-South stationkeeping (NSSK) requires around 50m/s per year. China outlined a plan to employ electric propulsion for NSSK to fully certify the technology and understand its capabilities before implementing it in other areas such as transfer from LEO to GEO and deep space exploration. Shijian-18 is China’s highest-throughput satellite to date, following in the footsteps of the Shijian-13 satellite that launched earlier in 2017 as China’s first HTS satellite with a total throughput of 20Gpbs, delivering capacity to the entire Chinese territory. 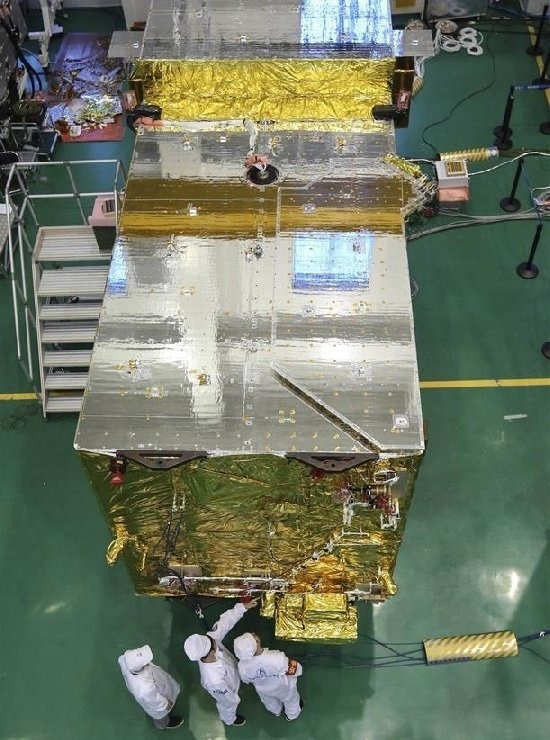 The Shijian-18 satellite is outfitted with a powerful Ka-Band payload with a total throughput in excess of 70Gpbs to support a variety of communications services such as multimedia distribution, Internet connectivity, aeronautical services, distance learning and telemedicine.